Bodega del Desierto (winery of the desert) is located in the Patagonian desert in a town called ‘25 de Mayo’ (hence the reference to 25 in their wine names). It is a long, long way from any other wineries in the region of La Pampa. Here, the extreme climate and strong winds result in distinctive and elegant wines. Patagonia has a very old, yet little known, viticultural tradition. It was one of the first locations selected in Argentina by the pioneers and immigrants on the XIX century, due to excellent conditions to produce high quality grapes for wine production. The later boom of local mass wine consumption (that reached its peak with 90 litres per capita in 1970) encouraged producers to move into northern locations with higher yield production and better transportation facilities (railroad to Buenos Aires, the main area of consumption). The viticultural potential of Patagonia was therefore kept almost unexploited for many years, till the Argentine reconversion to high quality wines in the eighties and nineties. It was in 2000 that Armando and Maria Loson, brother and sister from an Argentine family, had the chance to lead a family project on the High Valley of the Colorado River area, north of Patagonia - south of La Pampa province. After a thorough study of the soil and weather that determined the suitability to produce high quality grapes, they decided to plant the vineyard. At first, the project was to sell the grapes to other wineries but after the impressive results of the first harvest they took the chance to produce under their own brands. The soil is sandy and deep with variable content of stones. Its low organic matter content leads to restricted vine growth and to the natural development of premium grapes. 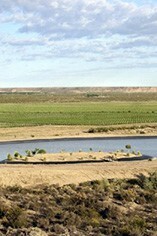 The main characteristic is the mineral component that is noticeable in all Bodega del Desierto’s wines. The vine structure was designed by Mario Toso on trellis, with a double-cordon training system and a density of 3,500 plants per hectare using all drip irrigation with pure and clean melt water from the Andean Mountains, taken from the Colorado River. Irrigation is essential as the average annual rainfall here is only 200mm. The winemaker is Sebastian Cavagnaro and the consultant agronomist is Enzo Mugnani. Ex-Robert Mondavi/Opus One superstar consultant winemaker, Paul Hobbs (twice named Wine Personality of the Year by Robert Parker), has been working with the vineyard and the wines since 2003. The geographic and climatic characteristics, with less than seven inches of rainfall a year, gave birth to the name Bodega del Desierto. Two of the most representative pictures of the soil inspired the design pattern for the labels. The virgin land where the vineyard was planted is still surrounded by 160 km of desert, ensuring a natural sanitation buffer and also maintaining the integrity of the ecosystem. In addition, the vineyard is located at the western end of the route 20 that connects Buenos Aires to Patagonia, well known as ‘ruta del desierto’ because of its isolated and long straight road with hardly anything from beginning to end.